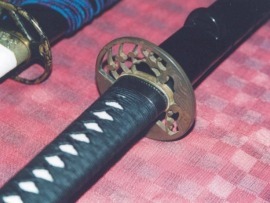 Japanese swords have a very unique feature called a hamon, and this is also one of the essential hallmarks of a Japanese sword. Basically, a hamon is a defined and limited region of very hard steel which is visible along the cutting edge of the sword. It is possible to make a hamon because of the properties of the steel used for Japanese swords. The most important properties of the sword steel are that it is very pure and it has a very high carbon content. 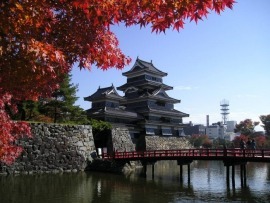 The Japanese developed their methods to produce a pure steel with a high carbon content over hundreds of years, and the process was perfected and defined in the Kamakura Period (1185-1233 A.D.). It is likely that the smiths developed their methods with the aim of being able to make a hamon, because Japanese sword steel is very well suited for that. The process of making a hamon is called yaki ire and appears simple, but it requires a large amount of experience and skill to make a good hamon. The basic method is straightforward: if a pure steel with a high carbon content (ideally for a Japanese sword, 0.6-0.7%) is heated to a high temperature (about 850-900 degrees C) the crystal structure in the steel changes from the ferrite and pearlite forms present at normal ambient or room temperatures to a form called austenite. Austenite is far harder than the common ferrite and pearlite forms. However, if the steel is cooled back down to ambient or normal temperatures, the austenite form breaks down or decomposes (it is only stable at high temperatures) and the steel reverts to the ferrite and pearlite forms again. If high carbon steel is heated and then cooled very rapidly (by quenching it in cold water), the austenite form changes to a form called martensite, and the martensite form is then stable at ambient (or room) temperatures. Martensite is very hard and much harder than the ferrite and pearlite forms of steel in the body of the sword. Ideally, a hamon is a very hard area of steel which defines the cutting edge of the sword. The hamon is composed of the martensite form of steel while the body of the sword is composed of the ferrite and pearlite forms of steel. If the smith makes his hamon correctly, the visible hamon (whatever shape it has) is pure martensite. The entire sword cannot be hardened (like modern knives often are) because the sword would be very brittle and likely to chip or fracture in use. The hamon allows the sword to cut very well, but still allows the sword to be resilient and resistant to breaking, fracturing or bending. In general, the smith does not want the edge area or hamon to be a completely uniform hard martensitic steel region. In the best or famous swords we see, the martensitic hamon is interrupted by hataraki. Hataraki are visible areas inside of the hamon which actually interrupt or break up the hard pure martensitic hamon. This makes the hamon less brittle, or divides the martensitic hamon into smaller regions and protects the hamon from being too brittle, and this also can limit the size of chips in the cutting edge, and limit damage in the hamon to very small areas. A very large, brittle, and uniform hamon could suffer a large amount of damage if it strikes another sword. Examples of hataraki are ashi, gunome, choji, yo, kinsuji, nijuba, etc. These hataraki are lighter colored regions inside of the hamon and are clearly visible. The best swords have a large amount of visible hataraki. In general, when hamon are described, it is the hataraki or details which are described and which characterize an individual hamon. Basically, hataraki are regions which are not fully hardened and are not pure martensite. They are a mixture of the ferrite and pearlite forms with the hard martensite form of steel. This mixture of steel has a color different from both, the hamon and the ji or body of the sword, and with a good polish, the hataraki become visible and also become the defining characteristics of an individual hamon. The basic method of making a hamon is to put a clay coating on the blade with a very thin or minimal coating on the edge area where the hamon will form, and a thicker heavier clay coating on the body of the blade. The blade is heated and then quenched in water to cool it very rapidly. The edge area with it’s thin clay coating cools very rapidly and the edge steel will be converted to martensite. The body of the blade with the thicker clay coating will cool more slowly, and the steel will remain in the softer ferrite and pearlite forms. The details in the hamon or the hataraki will depend on the complex pattern of the clay coating over the hamon area as well as the temperature the blade reached before quenching. A successful yaki ire process will produce a clear well defined hamon and leave the body of the blade in the original softer forms of steel. From what we usually see, it appears that a differential or non-uniform clay coating is necessary to produce a good hamon, however, a good sword smith can produce a hamon by heating and quenching a blade in water and with no clay coating at all. Some of the most famous schools made hamon with no clay and many national treasure blades came from these schools. Good examples are from the Ichimonji school and the Hatakeda school which were both active in Bizen during the Kamakura period. Making a hamon with no clay is called “hadaka yaki”. If no clay is used during yaki ire, the smith heats the blade to the proper temperature and then quenches it in water. If everything is done right, there will be a very complex and strong hamon. In fact the hamon can often be more complex and interesting than hamon made with a clay coating. It is not a simple process though. The blade must be heated to the proper temperature, and in addition, the blade is heated so that the edge area is visibly hotter than the body of the blade. The smith does this by heating the blade in the forge with the edge up. When the blade is the desired temperature, he then rotates the blade and heats it with the edge down in the forge. If this is done correctly, the edge area of the blade will be clearly brighter (and hotter) than the body of the blade. The edge are should be around 850-900 degrees C and the body of the blade about 750-800 Degrees C. The back of the blade will be cooler and about 700-750 degrees C. This temperature gradient is very important if the smith wants to form the hamon along the edge region of the sword.The hotter edge will change to martensite on quenching much more readily than the slightly cooler body and back of the blade. Another important factor is the carbon content of the steel. An optimal level is about 0.7% carbon. At this level, if the steel is cooled rapidly by quenching, and it converts rapidly and completely to the martensite form. The lower temperatures above the hamon area will limit or prevent the body of the blade from converting into a hard martensite form of steel. If this process is done correctly, a hamon will form only along the edge of the sword. Another important factor is the condition of the surface of the sword. It must be very clean and uniformly polished with a rough stone (usually arato or kongoto). Another important factor is the shape. Due to the physical behavior of steel and heat, heat will transfer out of the sword more readily through a narrow sharp region than from a thick area. This means that heat transfers more rapidly out from the sword from the edge area, and the edge area is thus more likely to cool rapidly and harden and form martensite. i.e. a hamon. In other words, a hamon is more likely to form on the edge than on the ji. The big variable or challenge in making a hamon this way is to control the shape and size of the hamon. Each hamon will be different, and and the width of the hamon and details of the hataraki will be different every time. The smith cannot control the fine details and structure of the hamon, although he does have some control over it. As the sword is plunged into the water, heat rapidly transfers out from the edge which is the lowest part of the sword in the water. This very high amount of heat causes the water to boil and form bubbles at the edge. Since the sword is in the water with the edge down and the sword becomes wider above the edge, these bubbles travel up along the sides of the swords and many cling to the sides of the swords. These air bubbles can also insulate the steel or affect how heat flows out of the sides of the sword, and this affects the pattern of cooling of the steel along the sides of the sword. This cooling (how fast the steel can cool) affects the shape and appearance of the hamon which will form. With this process, an interesting hamon can form, and the pattern of air bubbles and how they travel along the sides of the sword will affect the appearance of the hamon which will form. That means each hamon made this way will be somewhat different, but there is usually a large amount of hataraki such as choji, gunome, ashi, yo, kinsuji, etc., and the resulting hamon can be very spectacular. Ichimonji swords are a good example of this. An excellent example is the national treasure sword called “San Cho Mo” or “Yama Tori Ge” which are two readings of the same kanji (both readings are used in Japan). In summary, this method can produce beautiful hamon and many famous swords have hamon made this way. The disadvantages are that the smith cannot control this process completely. Many of the swords will have poor hamon or there may even be damage to the sword. If the hamon is not good, it will be removed and a new hamon will be made. This can only be done a limited number of times. This means that a sword with this type of hamon will generally be much more expensive to make (because of re-making the hamon, and loss of some swords after several efforts to make hamon). From about the middle of the Kamakura Period, smiths began to use clay almost exclusively. Today, smiths make utsushimono or copies of specific swords. Ono Yoshimitsu often makes utsushimono of the San Cho Mo national treasure sword. He first makes a batch of steel, and then makes one sword from it to test the steel and see how it reacts to yaki ire. He then makes another utsushimono sword in the shape and size of the San Cho Mo tachi. He takes several days to place the clay on the new sword in exactly the right pattern so he can reproduce the San Cho Mo hamon. By the end of the Kamakura period, smiths used clay almost 100% of the time to produce consistent and controlled hamon efficiently in the style and form they wanted, and most swords are made this way today, although some modern smiths do occasionally make hamon with no clay or with hadaka yaki. Page 182. Traditional yaki ire with a clay coating. Notice that most of the bubbles are forming in the hamon region, so the blade is cooling fastest in the planned hamon area. Page 183. Hadaka yaki. The blade has no clay on it. Notice that although the density of bubbles is greatest near the edge, there are numerous bubbles forming over the entire ji. This indicates that much of the ji (and not just the edge) is cooling rapidly and there will probably be a complex (but not completely controlled) hamon as a result. Zabrania się kopiowania i wykorzystywania zamieszczonych zdjęć i materiałów bez zgody właściciela. (H) Polityka prywatności.